An engineer from NIE Mysore and an MBA from SPJIMR, Mumbai, Madan Padaki had worked with Wipro, Infosys and Mphasis (Japan) – before being bitten by the entrepreneurial bug in 2000 when he co-founded MeritTrac as a pioneering idea in skills assessments. MeritTrac is today one of the leading Skills Assessment companies in the World and is recognized as a thought-leader in the sector, having won several awards like the NASSCOM Innovation Award & Deloitte Fast 50 India Award. MeritTrac has also been featured extensively in several books on entrepreneurship and is also a case-study at INSEAD. MeritTrac was acquired by Manipal Global Education Services, one of India’s largest education services company. 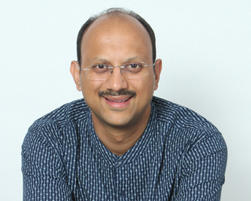 In 2011, he transitioned to Manipal Education from MeritTrac to head up Strategy, Innovation and International Partnerships and transitioned out in March 2013. He is currently the Co-founder & CEO of RubanBridge Private Limited, a rural last-mile services platform provides access, choice & convenience to rural consumers by leveraging the power of local entrepreneurs & technology. Today, 1Bridge as a brand under RubanBridge is present in 25+ districts across South India and has over 400+ rural youth engaged on its platform.